Even the toughest kit can let you down, especially if you do not carry out regular maintenance and cleaning. If you take care of your kit it will not let you down when needed. Try to take time on a weekly basis to look at one item of your everyday kit and carry out preventative maintenance. Keep the blades sharp, invest in a good sharpener such as the locally made “Warthog” as well as a smaller portable version like the “Blade Medic”. A blunt edge is pretty useless and increases the risk of one cutting oneself. If you have a knife such as an Opinel that has wooden handles then work on them as well, a light rub with grade # 00 steel wool followed by the application of a coat of oil will spruce them up and extend their life. 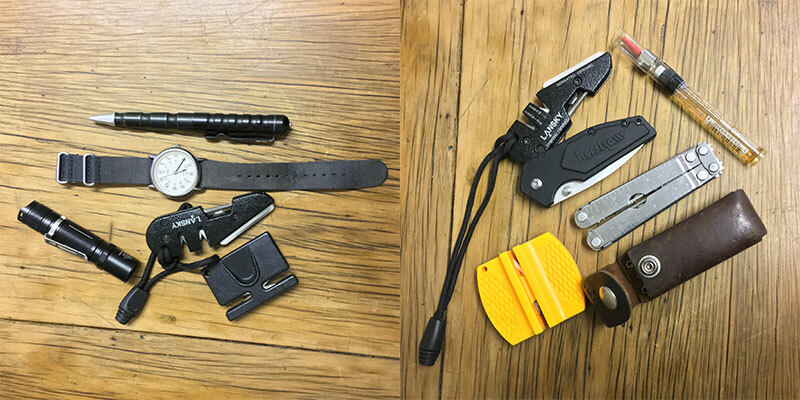 For everyday use one tends to favour a folding knife over a fixed blade, whether you carry a flipper, standard pocket knife or a lockback you knife will benefit from a bit of oil such as WD 40 on the pivot. If the blade is carbon steel oil will stop it from tarnishing when not in use. Any leather items such as wallets, boots or gear bags will definitely benefit from regular leather treatment and moisturising, not unlike your skin. We all tend to carry a rain jacket in our car, some lose the ability to repel water and may need an application of water repellent, this is sold at most good outdoor shops! Watches are generally neglected until they stop or the spring bar breaks and the strap no longer fits. But they do have a tendency to get dirty, regular cleaning with a suitable cleanser and even replacement of the strap will give a watch a new lease of life. When having a battery replaced it’s worthwhile getting the watch cleaned and having any seals checked and replaced. Torches have a daily role to play especially given the frequency of load shedding, one should replace batteries regularly to prevent leaking which could damage a torch irreparably, even note the date of the next replacement on your calendar, and check if you can switch to rechargeable lithium-ion batteries which will be cheaper in the long run and are environmentally friendly. Threads and o-rings would also benefit from a bit of TLC in the form of silicone spray (wipe off excess). The last item to look to would be the pen that you carry every day, it would also benefit from a cleaning and a wipe with silicone or a metal polish if the body is metal, expensive pens also require servicing every five or so years depending on use and performance. And always keep e few spare refills or ink for a fountain pen. Cameras are a topic on their own and should be touched up regularly with a lens pen and soft cloth, SD cards should be formatted and software updates should be regularly checked and carried out. If you change lenses regularly you may have to visit the Brand Centre near you for sensor cleaning. Any tips from our readers would be more than welcome.